"A tangy crisp with a hint of ginger and a nice crunch to the topping. The custard filling is soft and creamy, yet holds together beautifully. This makes a large crisp - great to take to a potluck or party." Move an oven rack to the center of oven and preheat oven to 350 degrees F (175 degrees C). Grease a 9x13-inch baking dish. Mix the white sugar, 3 tablespoons of flour, salt, eggs, orange zest, and ginger together in a bowl until well combined; stir in the rhubarb. Pour the rhubarb mixture into the bottom of the prepared baking dish. Thoroughly combine 1/2 cup flour, brown sugar, butter, and cinnamon by pulsing in a food processor or blender. Stir in the oatmeal; crumble the oatmeal mixture over the rhubarb. Gently pat the topping down to make a crust. Bake on the center rack of preheated oven until the topping is lightly golden, the rhubarb has fallen apart, and the juices are very thick and bubbling, 40 to 50 minutes. Check frequently after 30 minutes to see if bubbles are thick. It was quite sweet and I didn't taste much rhubarb. In the plus side I used plenty of it up! This is really good. I used two 8x8 pans instead and gave one to my sister. I will definitely make this again. Thanks for sharing! Wow--we loved it! I baked it a little longer for a real crisp topping. A new family favorite--thanks for sharing. An outstanding recipe! The combination of rhubarb and fresh ginger was a hit at my church's picnic. I garnished with strips of fresh ginger, so it looked as good as it tasted. Yumm! 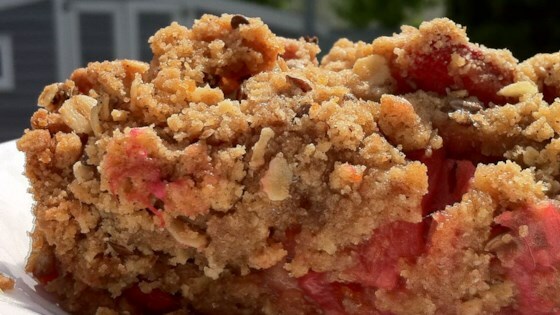 This recipe is so much more interesting that the plain old rhubarb crisp recipe. I added the 1/4 cup of OJ as another reviewer suggested-Good add in! This recipe was so good! It took maybe 10 minutes to prepare and my husband said it was the best crisp he had ever had! Definitely a keeper. This was totally yummy!!! Made it for my kids' grandpa who loves rhubard pie, but I'm not a pie maker...My kids loved it too!! !